Nestled in the far northern wilds of Orkney, Highland Park is the most northerly distillery in Scotland, beating out its neighbour Scapa by just half a mile. A distillery with a fabulous pedigree of over 200 years of history, it places a heavy emphasis on tradition, with Highland Park maintaining a floor malting. Incredibly consistent, their flagship 12 year old bottling is a key part of every whisky drinker’s journey. Despite its name the distillery is not found on the mainland Highland region of Scotland, rather it is an Island malt from Orkney, off Scotland’s north coast (though according to the Scotch Whisky Association classifications all islands other than Islay are consided part of the Highland region). Orkney is a difficult place to live, with extreme weather and bitingly cold winters. Indeed, of the 70 islands that make up "Orkney" only 20 are inhabited. Yet, the archipelago also provides the ideal setting for making whisky, with extremely fertile soil, a ready supply of peat and a constant sea breeze to add maritime flavours. Highland Park has made use of these features since before 1798, when church officer and illicit distiller Magnus Eunson founded the distillery. Highland Park has become renowned for its consistently high quality standard range, developing a line of bottles recognised for excellence the world over. Distillery Manager Russell Anderson suggests that tradition is responsible for much of this quality and consistency, saying: "It’s not about fashion, trends or bandwagons. There are no immature expressions of Highland Park and no accelerated maturation programmes. It is made today with the same enduring belief and integrity, to the same exacting standards, as it has always been. The established attitude at Highland Park is one of custodianship rather than management, of tradition rather than novelty." The distillery maintains many of these traditions in their techniques, which have remained much the same throughout its existence. Highland Park draws its water from the nearby Crantit Spring, which is extremely rich in minerals. The distinctive complex peat smoke flavour of their whisky comes through use of younger peat bricks to dry their malt, which often includes roots and heather branches. Whilst the floor maltings, where the barley is allowed to slowly germinate, adds another unique dimension to their single malt whiskies. At every stage, care and attention is devoted to the production of their whisky, with no shortcuts taken or corners cut. Drinkers of Highland Park can expect notes of citrus fruit, flowers, slight peat and sweet malty honey. The local church beadle and noted illicit distillery and smuggler Magnus Eunson founds a distillery on the hills above Kirkwall, Orkney’s largest settlement. Mansie, as he was known, would store barrels of whisky within the church, and Alfred Barnard in his milestone text Whisky Distilleries of the United Kingdom reporting an infamous instance: "Hearing that the Church was to be searched for whisky by a new party of excisemen, Eunson had all the kegs removed to his house, placed in the middle of an empty room and covered with a clean white cloth. As the officers approached after their unsuccessful search in the church, Eunson gathered all his people, including the maidservants, round the whisky, which, with its covering of white, under which a coffin lid had been placed, looked like a bier. Eunson knelt at the head with the Bible in his hand and the others with their psalm books. As the door opened they set up a wail for the dead, and Eunson made a sign to the officers that it was a death and one of the attendants whispered "smallpox". Immediately the officer and his men made off as fast as they could and left the smuggler for some time in peace." He was later arrested for his crimes. On the same site David Robertson founds Highland Park, becoming extremely successful. Robert Pringle, one of the excise men that had hunted for Eunson, and who would later establish the successful cashmere and knitwear company "Pringle of Scotland", purchases the High Park estate (after which the distillery is named) grounds, including the distillery itself. In an another ironic twist, the excise officer who had arrested Eunson- the first distiller on the site, John Robertson- a probable relative of David, gains control of operations. Indeed, some suspect that Eunson made a deal with him over the distillery’s ownership in order to avoid court. The distillery is officially named "Highland Park". Highland Park is licensed for the first time, and Robert Borwick becomes distillery manager. Highland Park is taken over by Robert Borwick’s son George, who oversees a period of decline and deterioration in the distillery and its fortunes. James Borwick, the younger brother of the Borwick family, inherits the distillery after George’s death. Like Eunson before him, James Borwick was a local clergyman- a priest. Unlike Eunson however, Borwick had little interest in distilling and consider it opposing to his religious duties as a priest. Highland Park further declined under his management, as production was slowed and attempts were made to sell the distillery. Eventually, prominent whisky company Stuart & Mackay begin to have some say in the business, and fortunes improve as exports to both Norway and India are made. Around this time Highland Park begins to be used by many blenders in their blended Scotch, notably Ballantine’s, Haig and Chivas. The Grant family, of Glenlivet fame (not to be confused with the Grants of Glenfiddich), take over the distillery. James Grant immediately sets about improving the distillery’s facilities, expanding the stills from 2 to 4, doubling capacity. After weathering the storms of World War One and Prohibition, and many years successful distilling, Highland Park is purchased by Highland Distilleries, an ancestor of the Edrington Group, that continues to own the distillery to this day. In response to Glenfiddich’s enormous success with producing "single malts", Highland Park’s marketing is vamped up, and its focus is switched to producing single malt whiskies. Sales increase notably. Highland Park achieves the astonishing feat of being the first and only distillery to receive a perfect score of 100 points from The Scotman’s team of expert whisky tasters. Again proving to be a canny operator in the field of marketing, Highland Park opens up a visitor centre at the distillery. The classic 12 year old expression was renowned in the 1990s for its high quality, with some suggesting it was undervalued. 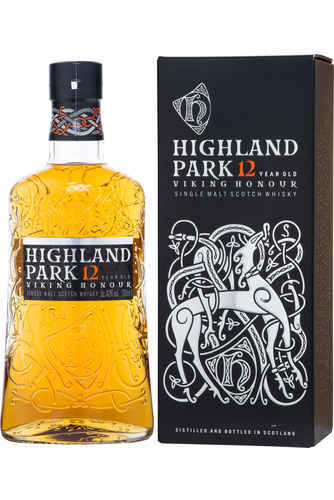 Highland Park expands its standard range, to include an 18 year old and a 25 year old. Edrington Group and William Grant & Sons acquire 50% of Highland Distillers each, gaining control of Highland Park. The visitor centre at Highland Park, which had received over £2million worth of investment from the distillery, is awarded with Visit Scotland’s Five Star rating. 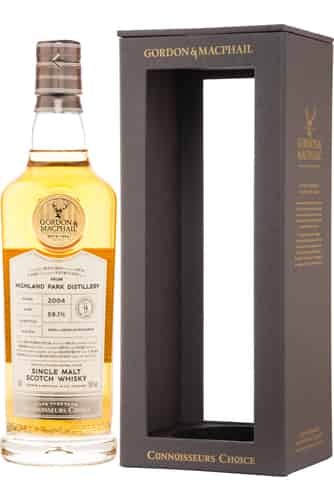 Alongside several other distilleries, Highland Park marks 2005 by releasing a 30 year old expression. Paul Pacult names Highland Park the "Best Spirit in the World" in his ‘Spirit Journal 100’. Highland Park 25 wins double gold at the San Francisco World Spirit Competition. Highland Park has paid homage to Orkney’s Nordic and Viking history, releasing several limited bottlings around the theme of a different Viking God, known as the "Valhalla Collection". These are non chill filtered and cask strength, and presented in wooden Viking longboats.